Renhold go top without kicking a ball! 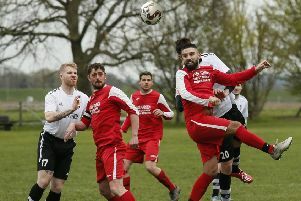 Renhold United went back to the top of the Bedfordshire League on Saturday without needing to kick a ball. With bottom of the table Lidlington United Sports unable to raise a side for their scheduled visit to Renhold, the three gifted points to United takes them back to the top of the Premier supported by Sportsform table. That was because second from bottom of Ickwell & Old Warden won 2-1 at former leaders Shefford Town & Campton, Andrew Vallom and Jake Smith netting the goals to take Ickwell to their third consecutive win against a lone reply from Michael Jones. Also gaining their third consecutive win were third place AFC Oakley M&DH who won 2-1 at Marston Shelton Rovers. Oli Plested and Alex Liburd were on their scoresheet against a lone reply from Rovers Jamie Cerminara. Whilst fourth place Flitwick Town took their unbeaten ways up to nine games by sharing the spoils in a 3-3 draw at Sharnbrook. Will Scutt netting twice and Peter Kowenberg once against home replies via Shaun Barnett, Richard Bull and Jim Burnside. Now unbeaten in their last six starts are sixth place Wootton Blue Cross who ran out 3-1 home winners over Eastcotts AFC, Phil Matthews netting twice and Carl Ibbotson once against a lone reply from Ollie Watton. Meantime, Caldecote are still looking for their first away win after losing 3-1 at Pavenham. Tom Wallace gave the visitors a first half lead before Tom Ellis evened matters from a corner on the hour, then a James Owen diving header eight minutes later gave the home side the lead which was then increased to 3-1 by Jack Harding. Elsewhere, over at Jubilee Playing Fields it was a game of two halves between hosts Wilstead and the visiting Sandy. The visitors via James Cooper, Jonnie Stratford and Tom McGhee raced into a 3-0 half-time lead before second period goals from Kieran Brasier, Adam Budek and Paul Jones saw the home side fight back and the game finish in a 3-3 draw. With league leaders Elstow Abbey having their game at AFC Oakley M&DH Reserves postponed due to an unfit pitch and second place Henlow sitting the afternoon out, third place Cranfield United took full advantage to close the gap on them both when they chalked up win number seven on the bounce with an 8-2 victory over Sundon Park Rangers. Martin Holland netted five times to go alongside a penalty from Liam Whitmee-Craig plus strikes from Joe Sames and Phil Kempsell against Rangers replies via Samuel Kehinde and Nick Buttgeig. Also winning big were AFC Kempston Town & Bedford College Reserves who ran out 7-2 home winners over bottom of the table Marabese Ceramics - Keegan Roberts with a hat-trick, Courtney Broughton with a brace being supported by single goals from Anas Bechkoum and Andrew Latimer against Tilermen replies from Samuel Holmes and Ricky Bruniges. There was a return to winning ways after seven losses for Shefford Town & Campton Reserves who emerged 2-0 home winners over Riseley Sports. Jordan Robbens and Malcom Marimirofa scored the vital goals. Whilst Potton Town, with goals from James Pyman and Chris Cooper, were also 2-0 home winners over AFC Harlington. The final game in this division saw Meltis Albion run out 3-1 winners at Bedford SA, Alexis Kamenan netting twice and Sahr Songa once against a lone home reply from James Allen. Great Barford made their way into the hat for the last four draw by running out 3-1 home winners over Queens Park Crescents. Reuben Hukin netting all three goals against a lone reply from Anish Khinda. There is no change at the head of the division two league table following wins for the top four clubs. League leaders Clapham Sports took their winning ways up to nine games by winning 2-1 at Elstow Abbey Reserves. Bradley Winton and Sam Maddix were on their scoresheet against a lone Abbey reply from James Cane. Whilst second place Stevington made it 11 wins on the bounce with a 9-0 home thumping of Moggerhanger United. James Bourke was on the mark with a hat-trick, Kieran Souter with a brace being supported by single strikes from Alex Smith, Reece Williams, Jordan Wright and Joe Holyoke. Now on an eight game winning run are third place Westoning who were 4-3 home winners over Marston Shelton Rovers Reserves, Ben Dashwood and Glen Cooksley both netting twice against Rovers replies from Jamie Watson, Mark Champkin and Gary Russon. Whilst fourth place FC Houghton are now on a 12 game winning run after winning 3-0 at Bedford United thanks to a brace from Lawrence Taylor and a single strike from Paul Taylor. Having lost their last six away games Renhold United Reserves put that right by winning 8-1 at Meltis Albion Reserves who are now on a seven game losing run. Delroy Phillips scored a hat-trick beand was backed up by braces from Josh Burnapp and Michael France plus a single strike from Josh Cowley against a lone Albion reply via Antony Ursell. Elsewhere, Caldecote Reserves were 5-0 home winners over Kempston Hammers. Nicky Albone and Jake Bruce both netting twice alongside a single goal for Rhys Parker to bring up the nap hand. The scheduled Kempston Athletic v Wilstead Reserves game was postponed due to the state of the pitch at Cutler Hammer. Likewise there is no change at the head of the Division Three league table following wins for the top three sides. For current leaders Lea Sports PSG it was a thrilling 4-3 victory at Atletico Europa to take their winning away ways up to five games. Behind to an 11th minute strike from Kane Alexander, they were to draw level when Owen Malcolm netted from distance in the 36th minute only to then fall behind again two minutes from the break when Mo Banda netted for the hosts. We were some 20 minutes into the new period before Kane Smith with a header made it 2-2 and they then took the lead for the first time 12 minutes from time when Malcolm notched his second goal of the afternoon to make it 2-3. Just two minutes later Europa’s Rob Ginn was red carded but with just two minutes showing left on the watch Mo Banda netted his second goal of the afternoon from the penalty spot to even things at 3-3. Yet PSG were not to be denied and in time added on first we saw Ryan Durrant hit the winning goal then Europa reduced to nine men with a red card for Simon Gatward. For second place Cranfield United Reserves it was win number six on the bounce in winning 3-0 at Dinamo Flitwick. Adam Kerr netted twice and Dan Mclaren once. Whilst third place Flitwick Town Reserves retained their unbeaten home record with a 4-1 victory over Westoning U20, Benn Ward, Mark Bartlett, Chris Bull and Ryan Hill on their scoresheet against a lone reply from Taylor Clayton. Now unbeaten in their last five outings are sixth place FC Serbia who won 4-0 at now bottom of the table Caldecote U20, Milan Marusic with a brace being supported by single goals from Murstak Alom and Miroslav Zivkovic. Whilst moving off the bottom of the league table are Mid Beds Tigers who after 10 straight defeats recorded their first home win of the season in beating Shefford Town & Campton A 3-0. An own goal plus goals from Daniel Whitten and Craig Tester doing the damage. Also winning for the first time on home soil this season were Sandy Reserves with a 3-1 victory over White Eagles. Andy Barker with a brace plus a strike from Chris Gregory only being replied to once by Jacer Tereszkiewicz for the Eagles. The scheduled Ickwell & Old Warden Reserves v Clifton game was postponed due to the state of the pitch on The Green.